When it comes to exclusivity and luxury, no other surface compares to semi precious stone. It provides your home with a subtle touch of distinction, decorating it with real home jewlery. Semi precious stone slabs are made of the same stones used in necklaces, rings, bracelets and other jewlery. 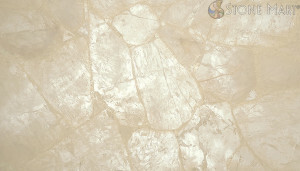 Each slab is therefore treated like a jewel, from the initial raw material selection process, to the moment it is hand picked by Stone Mart, passing through the most select and precise processing methods. 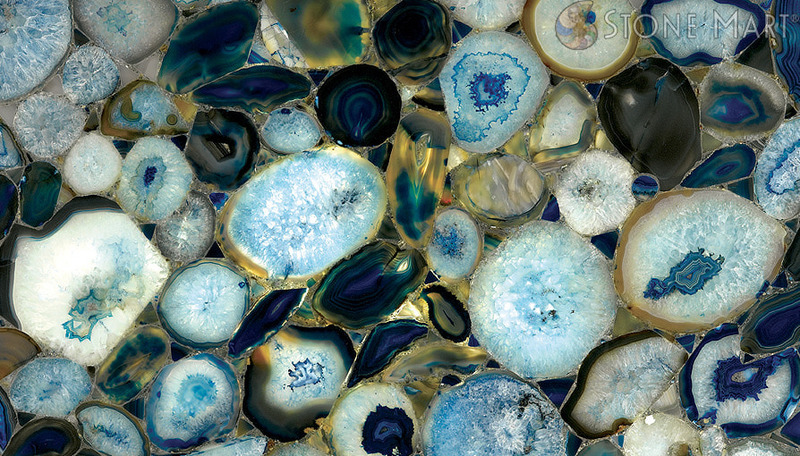 Stone Mart stocks an unmatched selection of semi precious stones of all types and colors, guaranteeing you will find at least one you will absolutely fall in love with. Apart from seeing and touching each slab, you will be able to appreciate its beauty within the unparalleled context of Stone Mart’s signature showrooms. 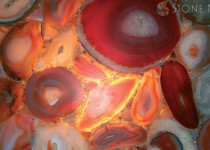 Some semiprecious stones are translucent and can therefore be back lit to enhance the richness of their colors. 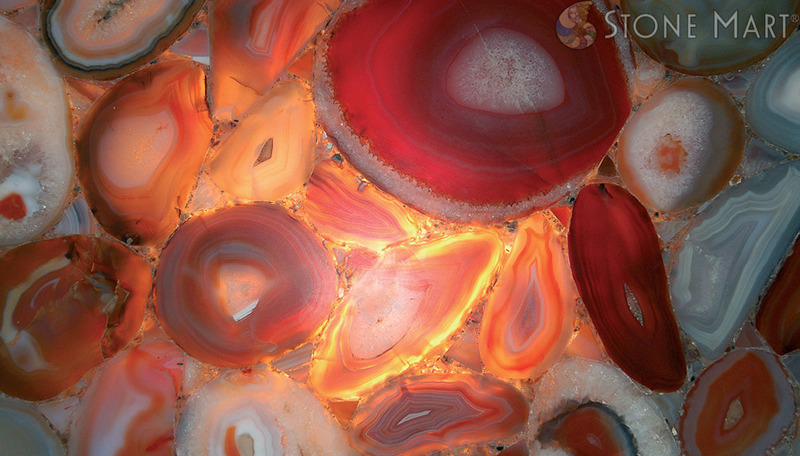 From ice-blue stones like Blue Agate to stunning red stones like lava-resembling Carnelia. Some others are natural works of modern art that could very well hang on the wall surrounded by a frame. 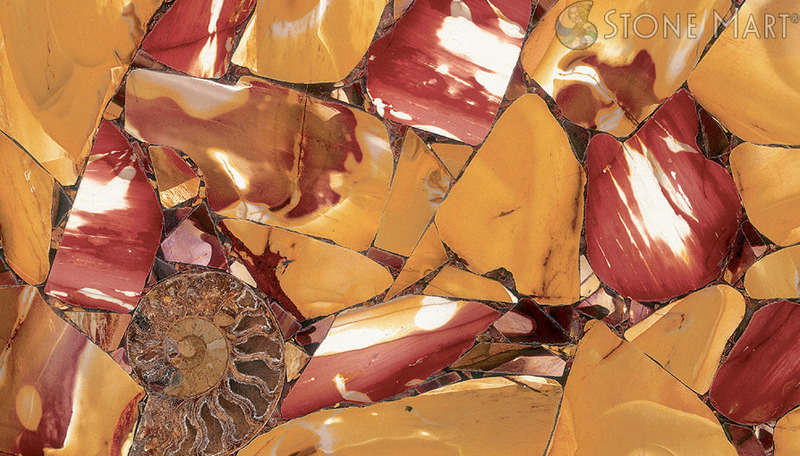 Golden Caramel, with its unlikely combination of surreal and contemporary tones of shiny red and yellow, mixed with the tradition brought by fossil shells represents a very exclusive option. On the other side of the range, Jungle Jasper provides a much more organic look, sustained by the prominence of green and brown tones that create a jungle-like atmosphere. 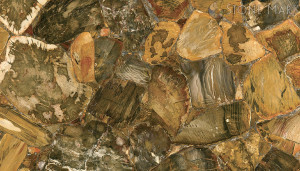 The large diversity in Stone Mart’s semi precious range is not limited to color pattern but it also manifests itself in the variety of visual textures available. 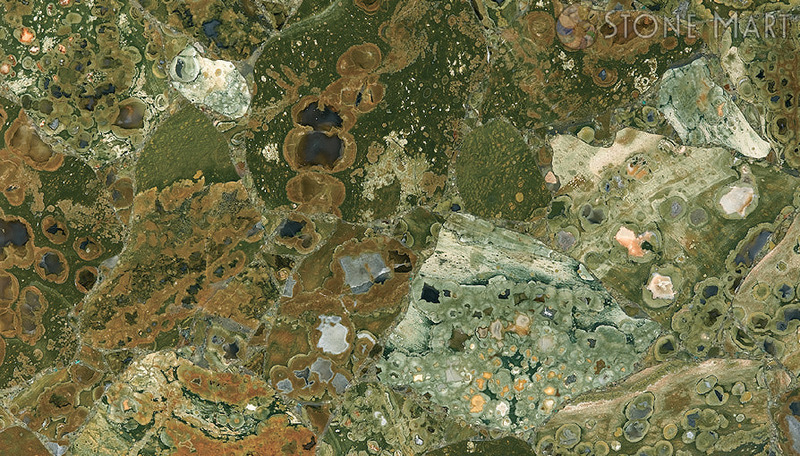 From the modern, crystal looking appeal of Classic Quartz, to the more rustic and traditional built of Desert Petrified Wood. Regardless of your preferences or of whether you already had a preset idea of what you wanted for your kitchen or bath, Stone Mart’s semi precious range is a must see for everyone desiring to enhance the luxurious look of her house with a touch of unique elegance.